And that means putting the brakes on it, or pulling out of it completely, at any time leading up to signing the relinquishment papers, which can’t be done until after your baby is born. Who you choose and how you go about choosing your baby’s adoptive parents is completely up to you. And while there is no one right way to pick a family, there are many wrong ways. Here are 8 common mistakes you want to avoid as you begin your search. If there’s one thing you should avoid at all costs, it’s this. Choosing a family for your baby is probably the biggest decision you’ll make next to creating an adoption plan. With so much on the line and so many families to choose from, you need to take as much time as you need to make an informed decision. Don’t let anyone push you into choosing a family until you’re 100% ready and confident of your decision. Yes, finding the right family can take a huge load off of your shoulders and put your mind at ease. But if you’re not ready it can also add extra pressure to an already stressful situation. Take control of your search and don’t rush and don’t settle. Choosing to place your baby for adoption can stir up all kinds of fears. One of them is that you won’t be able to find a family for your baby or you won’t be able to find one in time. And yet no matter how you anxious you’re feeling, you should never feel compelled to choose the first couple you find. Even if the family you choose is exactly what’s you’re looking for, it’s a good idea to consider at least two others, as a point of comparison, before making a final decision. A placement can’t take place until your baby is born. So don’t rush it. Even if you haven’t made a decision by then, there are other options you can look into such as fostering or parenting on a temporary basis while you decide. You might know of or have heard about a family that wants to adopt. But that doesn’t mean they’re ready to do so. In order to become an adoptive family, waiting parents have to undergo a rigorous screening process that includes everything from criminal background checks to medical and financial screenings. It also includes hours of training and education courses to ensure that the couple is ready, willing and able to adopt. So make sure that the couple you choose is pre-approved and qualified. If they aren’t, it could cause complications and add unexpected delays to your search. Other people — from family members to friends to total strangers — will have an opinion on your adoption plan and about which family you should — or shouldn’t — choose. And that’s okay. They’re entitled to their opinions. Just keep in mind that what they say is just that: an opinion. They may not have all of the facts or understand your reason for placing, and you may not feel like explaining it to them. And that’s okay too. It’s your baby, and ultimately it’s your decision on whether to go ahead with your adoption plan and choose an adoptive family to raise her. Initially you may decide that adoption is the best choice for you, and you might have even chosen what you thought was the perfect family for her. But then things changed, and now you’re not sure you want to move forward with your plan any more. What do you do? As an expectant mother, you have the right to chance your mind. If you feel that a situation isn’t right for you or you have a change in heart, you can walk away from it at any time. Yes, it will be hard for the family you’ve chosen. But at the end of the day, you need to do what’s best for you and your baby. And if that means deciding to parent or going back to the drawing board and finding another family, that’s your choice. Every family that’s approved to adopt will create a profile with information and photos about themselves designed to give you a glimpse into their lives. And while it’s tempting to choose a couple on the basis of their profile alone, ideally you should meet them before making a final decision. Nothing will tell you more about them than spending time together face-to-face. Watching the couple interact with each other and with you will give you a better sense of who they are. And it will also give you a chance to ask questions about their plan and where you fit into it, and gauge their reactions first-hand. In much the same way that you wouldn’t judge a book by its cover, don’t make the mistake of judging a family by their profile alone. Adoption is a complicated process. There are so many rules, regulations and laws it can make your head spin. Fortunately you don’t have to go through the process alone. An adoption worker can help you. Besides navigating the process from beginning to end, she can explain all of your options and help you screen potential families for your baby. In addition, you should get independent non-biased representation from a legal expert or licensee who can run through the legal requirements and explain issues like birthfather rights and the relinquishment process. All counselling is confidential and free, whether you decide to place or not. So even if you think there’s no need for it, you should still look into getting all the assistance and support that’s available to you. 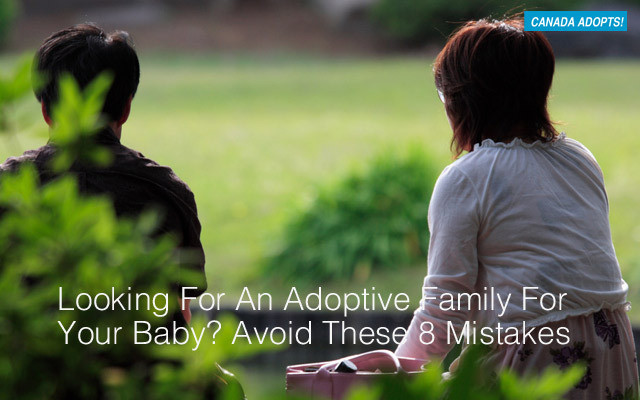 It’s easy to get overwhelmed when you’re looking for an adoptive family for your baby. With so many couples to choose from, it’s hard to know which one is right for you. Every family will have something to offer. The key is to decide beforehand what is important to you. Is it the family’s lifestyle? Their educational background? Their race? Religion? Location? Jobs? Plus, what kind of relationship do you see yourself having with them after placement? Do you want to keep in touch by phone, email, visits, Facebook, Skype? Again, the choice is yours and you’ll need to discuss it with the adoptive family beforehand to make sure you’re both on the same page. And there’s no better time to do that than right now while you’re building your relationship. Choosing a family for your baby is a huge responsibility and you want to make sure you do it right. To avoid making a mistake, start looking into the process and your options now. You owe it to yourself and ultimately to your child.